CENTRE STAGE: Members of the Campion Collerge cast performing their winning version of Macbeth, which heads to the UK in 2016. Few Jamaicans have had the good fortune of visiting Stratford-upon-Avon, the birthplace of William Shakespeare. Members of Campion College’s drama club will have that once-in-a-lifetime opportunity to treasure when they embark on a tour of the United Kingdom and participate in the Shakespeare Festival come next year. 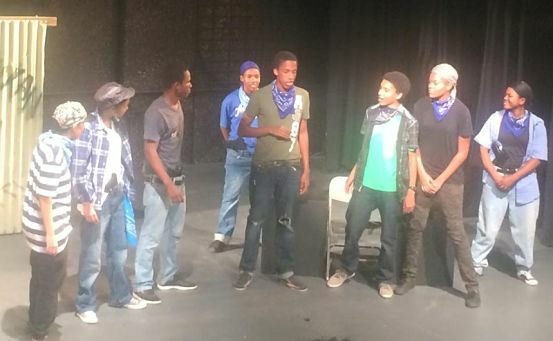 The St. Andrew-based school won the inaugural Jamaica Shakespeare Schools’ Championship at the Little Theatre in Kingston on the weekend, and as the winning school they will jet off to the UK to join up with the Royal Shakespeare Company and tour with their production of Macbeth, to commemorate the 400th anniversary of the death of the world-famous English playwright and poet. Campion emerged king of the hill on Saturday after a long day of performances at the Little Theatre, featuring the competition’s top seven schools vying to finish as one of the judges’ top two, who moved on the grand finals held in the evening. For the prize package, which included a shiny new trophy, Campion’s clever urban version of Macbeth faced off with an entertaining and multilayered spin on The Merchant of Venice performed by a vibrant cast of Kingston College and St. Hugh’s High students. Waterford High, Ardenne High, Glenmuir High, the American International School of Kingston and the Wolmer’s Trust completed the batch of seven contending schools, following the July eliminations, which showcased the productions of 17 schools from across the country. Launched in February, the drama competition (a first of its kind for Jamaican schools and audiences) is the brainchild of British philanthropist Dr. Tony Sewell, CEO of Generating Genius, with endorsement and full sponsorship provided by the Jamaica National Building Society. At the same time, both Dr. Sewell and the JN Foundation’s Dr. Renee Rattray are quick to draw attention to the competition’s long-term benefits on the lives of the young participants, many of whom say they now have a keener understanding of Shakespeare’s vision – and the power of the English language.